It was an experiment I started in 2008. I decided to sign up to the formula companies, checking off I would be exclusively breastfeeding. And the formula samples just kept coming! -- The formula companies really wanted me to formula feed! It is 6 months today since the birth date I used when I signed up for the formula companies, checking off I would be exclusively breastfeeding. It's time to give them to the women's shelter since I won't be needing them - but I wanted to do a final tally - it was an interesting comparison. Grand total - 21 cans of powder, 12 cans of ready-to-feed and 8 toddler formula within the first 6 months! From Enfagrow Toddler formula, they sent $6 in coupons. And remember, I DID check off that I planned to exclusively breastfeeding! It looks like Canada sends way more formula than the US, so they must be trying a lot harder up here? The Canadian formula was shipped to southern Ontario, Canada. The US formula was shipped to North Fort Myers, Florida, where my in-laws were staying for the winter - I don't know if different areas get different responses? Then check out my Huge List of Breastfeeding Freebies! -- Is there another baby at my house needing formula? 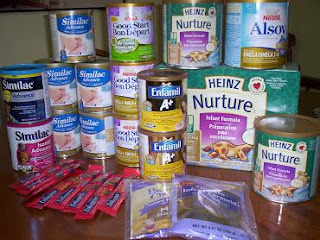 I did this experiment years ago, signing up for free samples of formula, saying I was planning to fully breastfeed, and I received something like 45 cans of free formula and $450 in formula coupons in that first year!! I donated all to the food bank. But it has been about 5 years since I originally requested free formula. Yet every couple of years I get another box of free formula in the mail, congratulating me on my baby-to-be. Another package arrived yesterday - I dropped it off at the food bank today. Does the formula company know something I don't?? I thought I knew where babies come from... but apparently there are several babies hiding somewhere in my house. And they all need formula!! 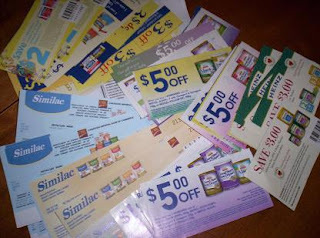 -- Since I posted my last update, Similac has continued to send me more coupons almost every day. I now have $40 total more in coupons! Pretty aggressive marketing for my new baby ! !